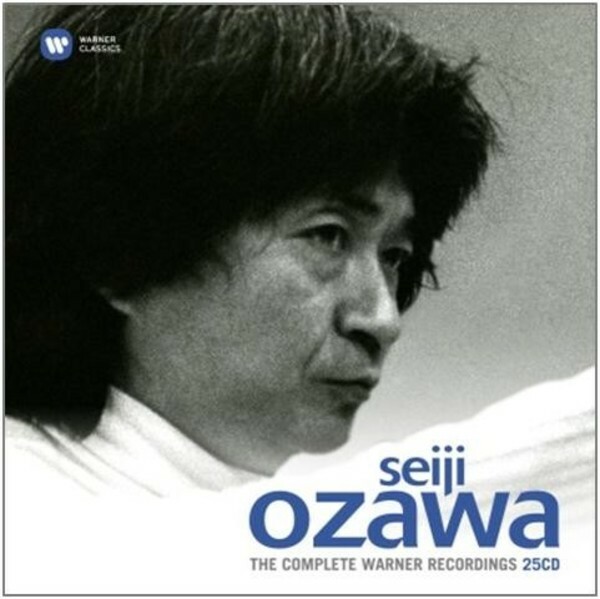 To mark the 80th birthday of the dynamic Japanese conductor Seiji Ozawa in September 2015, Warner Classics has released a sumptuous 25-CD box containing his complete recordings for the label, which were made between 1968 and 1997. The set places an emphasis on Seiji Ozawa�s mastery of the colourful, large-scale orchestral scores of the 19th and 20th centuries and on his collaboration with such soloists as Itzhak Perlman, Anne-Sophie Mutter and Mstislav Rostropovich. The scope of the 25 CDs is wide � from mainstays of the Romantic repertoire to Modernist masterpieces and works premiered as recently as 1997 � and the recordings reflect Ozawa�s status as a global maestro and his relationship with a number of the world�s finest orchestras, including the Boston Symphony Orchestra (of which he was Music Director for 29 seasons), Chicago Symphony Orchestra and the Berliner Philharmoniker. Seiji Ozawa was born in 1935 into a Japanese family living in China and trained at the Toho School of Music in Tokyo. He came to international attention when he won the Besan�on Conducting Competition in France in 1959, after which he was invited to Boston, where he studied with Charles Munch and Pierre Monteux, winning the Koussevitzky Prize in 1960. He subsequently received a scholarship to study in Berlin with no less a maestro than Herbert von Karajan. In 1961, another luminary of comparable brilliance, Leonard Bernstein, recruited Ozawa to be Assistant Conductor of the New York Philharmonic (1961), and he made his professional debut in 1962 with the San Francisco Symphony. Over his career, Ozawa, who is known for his very physical conducting style and his preference for conducting without a score, has also been Music Director of the Vienna State Opera, Toronto Symphony Orchestra and San Francisco Symphony, Artistic Director of the Tanglewood Festival and Music Director of the Chicago Symphony Orchestra�s Ravinia Festival. He has also enjoyed close associations with such institutions as the Vienna Philharmonic Orchestra and the Paris Op�ra. In Japan, he is Artistic Director of the Saito Kinen Orchestra, which he formed in 1984, and of the Saito Kinen Festival. Ozawa was diagnosed with cancer of the oesophagus in 2010 but, following successful surgery, he has returned to conducting and continues to mentor young musicians. - Variations on "I Got Rhythm"